The post Mike Reilly’s book: Finding My Voice appeared first on Triathlon Magazine Canada. Pasta is likely the most glorified pre-race meal. It’s the one that gets all of the attention for being a brilliant carb-loading food. Though this may be true, pasta bowls can get boring. There is however another famous Italian dish that’s just as good, if not better. Margherita Neapolitan style pizza with buffalo mozzarella, tomato sauce and basil. Pizza is an excellent meal option. Frozen store-bought boxes or Americanized pizzas certainly fall under the unhealthy category, but a traditional Neapolitan thin-crust pizza can be just as nutritious as a big bowl of pasta. Simplicity is key when adorning these bubbly crusts. The classic Margherita pizza is simply tomato sauce, mozzarella cheese, cherry tomatoes and fresh basil. A minimal amount of fresh ingredients can give enough punch to the flavour palate so that it feels like there’s way more going on than what’s presented. In a medium bowl, thoroughly blend the flour, yeast and salt. Add the water and, with a wooden spoon and/ or your hands, mix thoroughly. It’s easiest to start with the spoon, then switch to your hands. Flour a work surface and scrape out the dough. Divide it into 4 equal parts and shape them. For each portion, start with the right side of the dough and pull it toward the centre, then do the same with the left, then the top, then the bottom (the order doesn’t actually matter; what you want is four folds). Shape each portion into a round and turn seam-side down. Mould the dough into a neat circular mound. The mounds should not be sticky; if they are, dust with more flour. Once ready to bake, place the pizza stone in the oven, so it is about 20 cm from the broiler. Preheat the oven on bake at 500 F for at least 30 minutes. Take one ball of dough and generously flour it in your hand, and the work surface. Gently press down and stretch the ball of dough out to 25–30 cm. Don’t worry if it’s not round. Don’t handle it more than necessary; you want some of the gas bubbles to remain in the dough. It should look slightly blistered. Flour and place some cornmeal on a pizza peel (or an unrimmed baking sheet) and lay the disk of dough onto the centre. Then, spoon sauce over the surface and spread it evenly, leaving about an inch of the rim untouched. It is now ready to be topped with your favourite pizza toppings and cheese. The oven should be pre-heated to 500 F by this time. Now, set your oven to the highest setting it can go, about 550 F, if possible. Always keep an eye during the baking process and be aware of smoke levels. Do not leave pizza baking unattended. With quick, jerking motions, slide the pizza off the pan onto the stone. Bake for anywhere between 5–10 minutes depending on your oven’s abilities, the top should be bubbling and the crust starting to brown nicely. Remove, cut and serve immediately. The post RECIPE: A Triathlete’s Pizza appeared first on Triathlon Magazine Canada. The post 5 tips for spring riding appeared first on Triathlon Magazine Canada. Wie beim P5X brauchten sich die Designer des Triathlon-Zeitfahrrades P3X nicht an die im Straßenradsport einzuhaltenden UCI-Rahmen-Boxen halten. Aufgrund der beim „großen Bruder“ gesammelten Erfahrungen sollten beim P3X nicht nur die neuesten Entwicklungsstandards berücksichtigt werden, es sollte auch viel leichter sein. Letzteres wurde mit einem um 16 Prozent leichteren Rahmen-Set erreicht. Darüber hinaus wurde auch das Gewicht von Lenker (13%), Sattelstütze (22%), Nutrition-Storage am Lenkkopf (43%) und der Aero-Bars (8%) reduziert. Die Tretlager- und Lenkkopf-Steifigkeiten erhöhten sich gegenüber dem P5X um 8 Prozent (Lenkkopf) beziehungsweise 15 Prozent (Tretlager). Übernommen wurde die stufenlose Höhenverstellbarkeit des Auflegers, vergleichbar mit den Einstellmöglichkeiten eines Sattelrohrs. Spacer werden nicht mehr benötigt. Der 400 Millimeter breite Basislenker kann zur besseren Erreichbarkeit der Bremsen an den Ausfallenden um bis zu zwei Zentimeter gekürzt werden. Die Armauflagen können ebenfalls individuell positioniert werden, jedoch liegen die Unterarme vergleichsweise eng beieinander. Der Triathlet kann bei den Extensions den Winkel in 5er-Schritten von waagerecht bis 15o (nach oben) adjustieren. Wie beim in der vergangenen Woche präsentierten neuen P5 setzt Cervélo bei der Klemmung der Laufräder des P3X auf die im Mountainbike-Sektor gängige Steckachsen-Technologie. Scheibenbremsen – ein Rahmen-Gabel-Set für klassische Felgenbremsen wird nicht unterstützt –, die bei allen Witterungsbedingungen ein optimales Bremsverhalten garantieren, runden das neue P3X ab. Bereits zwei Wochen vor der offiziellen Präsentation durfte die tritime-Redaktion das neue P3X bei einer mehrstündigen Testausfahrt unter die Lupe nehmen. Einen ersten Testbericht werden wir zeitnah an dieser Stelle veröffentlichen. Der Beitrag Cervélo P3X: It‘ Personal! erschien zuerst auf tritime - Leidenschaft verbindet. 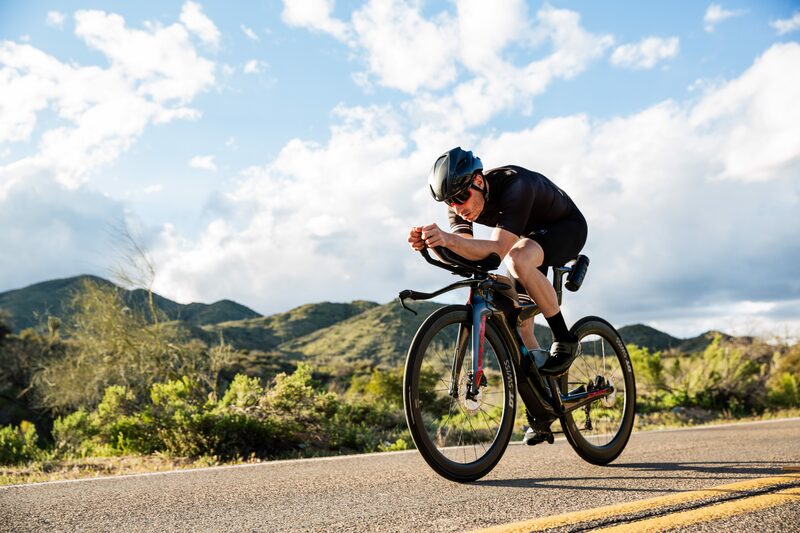 The post Cervélo launches the new P3X appeared first on Triathlon Magazine Canada. The post 5 conseils pour s’entraîner sans entraîneur appeared first on Triathlon Magazine Canada. The shoe combines the Flyknit upper that Nike wearers have come to love, with the durable React foam. On top of that, they slid in the full-length carbon-fibre plate found in the Zoom Vaporfly 4%. The post Fresh kicks for spring appeared first on Triathlon Magazine Canada. The post 5 workouts to help you run a faster 5K appeared first on Triathlon Magazine Canada. On Wednesday, as reported by the BBC, Munich’s state prosecutor Kai Graeber said the 21 athletes tied to the doping scandal are from three winter and two summer sports from 2011 to 2019. “There are three-figure cases of blood being taken out and then being reintroduced worldwide, in Germany, Austria, Italy, Sweden, Finland, Estonia, Croatia, Slovenia and Hawaii,” Graeber said. The investigation is currently ongoing, and no details on the names of the athletes or their sports are available at this time. The post 21 athletes linked to German doctor doping scandal appeared first on Triathlon Magazine Canada.